Me climbing the Klettersteig Huterlaner. I did my first Austrian via ferrata last week, introducing my brother-in-law Nick and his son Ben to climbing with cables. The Klettersteig Huterlaner was a fun and varied climb with some good views down the Zillertal and of the town of Mayrhofen. As it starts only two minutes walk uphill from the base of the valley and is in the woods, it had a different feel to the mountainous via ferrate I’ve done elsewhere. Instead of following a ridgeline or going up a rock face, the Klettersteig Huterlaner weaved its way through the trees in order to keep to the most interesting buttresses and slabs. This meant that the route felt a bit contrived at times, but also that it included sections of really enjoyable climbing. Having a cold drink at a hut following a very hot climb made for a nice end to the climb too. However, we each only had a sip of the complimentary schnapps that was given to us at Gasthaus Zimmereben (which probably makes a good income from the climbers of the four via ferrate that end minutes from its door) before descending through the woods. A via ferrata gear rental shop and, behind it in the trees, the Klettersteig Huterlaner. Ben on the first section of the Klettersteig Huterlaner. Me on the Klettersteig Huterlaner. Nick and Ben waiting for some climbers to get past a C graded section on the Klettersteig Huterlaner. Nick climbing the Klettersteig Huterlaner. Nick waiting for a chance to continue climbing on a congested section of the Klettersteig Huterlaner. Me crossing the wire bridge on the Klettersteig Huterlaner. Nick and Ben at the top of the last major bit of climbing on the Klettersteig Huterlaner. Mayrhofren seen from the Gasthaus Zimmereben. The Zillertal seen from the descent from the Klettersteig Huterlaner. 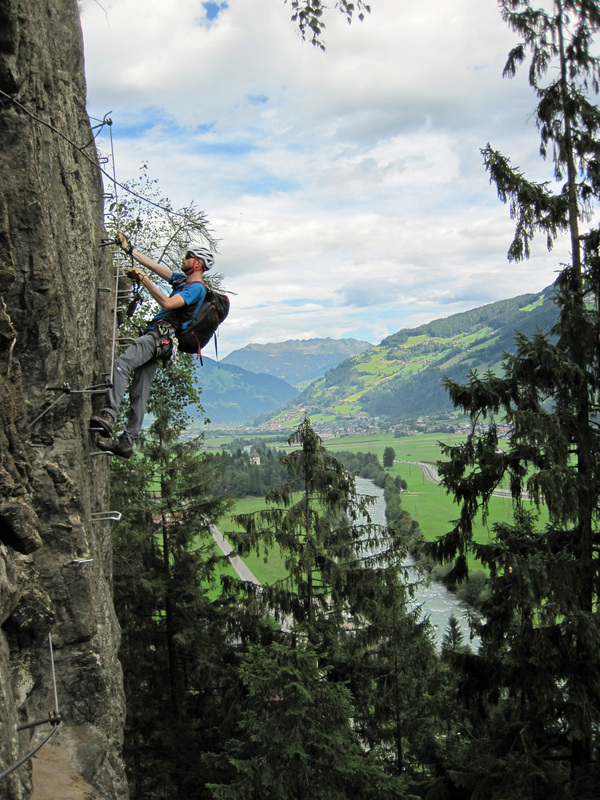 The Zillertal tourist information publishes a great booklet on the via ferrate and climbing in the area. It’s available in the tourist information offices and online. There is also a good overview of information on the via ferrate by Mayrhofen, including the Klettersteig Huterlaner, on the local tourist information website. The website of the Gasthaus Zimmereben has a brief description and topo of the Klettersteig Huterlaner too. In addition, three German language via ferrata sites that include information, topos and photos of the Klettersteig Huterlaner are klettersteig.de, bergsteigen.com and via-ferrata.de. I certainly thought that the three via ferrate I did in the Zillertal were great. Hopefully I’ll have a chance to try a few more out. I have to say that looks seriously scary! Especially the ‘casual place to wait’ photo! I guess that it could be – you just need to be good at coping with exposure. I’m normally good on a rope but think that would be just too much for me! I can understand why. Some new via ferrata, particularly the sport-style via ferrata like this one, seem to be designed deliberately to maximise the exposure that climbers experience. I guess it’s all about giving people a thrill and increasing their sense of climbing on the edge, but that style of climbing isn’t for everyone. I’d definitely agree with that – I’m sure that’s what they’re trying to do. I suppose a lot of people are just looking for that thrill and will love it. And the photos from it do look awesome – just not for me!